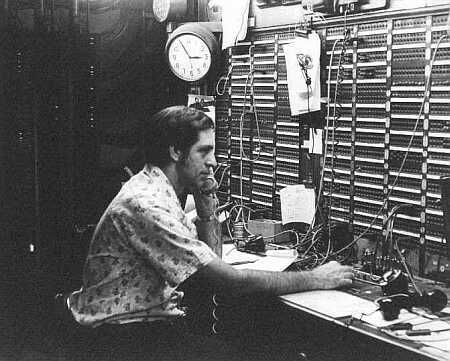 Today the PRR's network is generally accepted to be the largest private telephone system in the world. Its transmission lines stretch 41,000 miles. It's cost, together with that of the associated teletype network, totals $35 million. 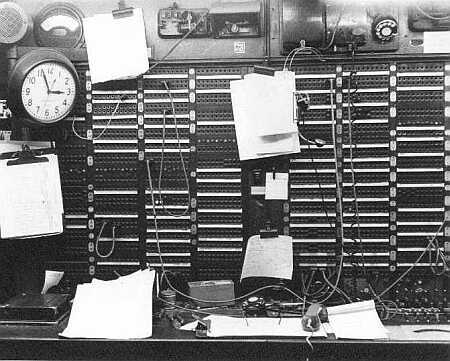 On any typical day, PRR lines carry an estimated half-million calls. The Pennsy was very early in its investigation of the telephone for possible use on the railroad. In 1877, at the PRR's invitation, Thomas A. Watson, Bell's assistant, and Gardiner G. Hubbard, his financial backer, demonstrated the telephone to railroad officials in Altoona. In 1897, the South Fork branch became the first PRR line to dispatch its trains by phone. 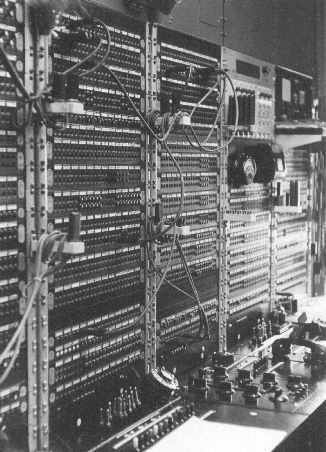 By 1920, the railroad was dispatched almost entirely by telephone. 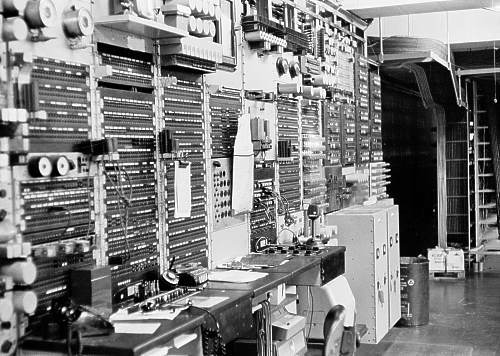 The equipment used was classic Western Electric and the facilities were built with the same care that AT&T built their own toll network. 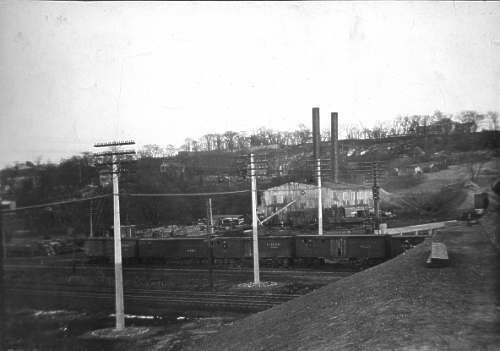 While extensive open wire plant lined the railroad west of Harrisburg, the electrified lines east of that city were all served with paper insulated lead cable. Where this cable was aerial, it was wrapped with steel tape to provide electromagnetic shielding from the electrification. On these facilities could be found train wires, block lines, message wires, power directors lines, teletype circuits, traction power and interlocking remote control and telemetry, PBX trunks and more. 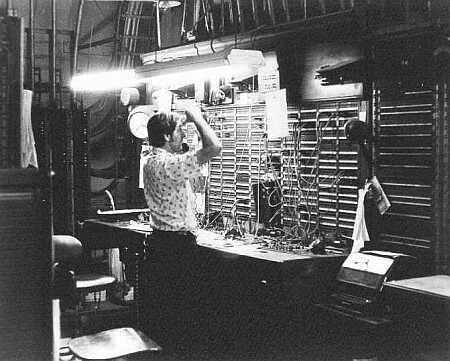 In 1955, between tower and station lines and wayside telephones, the railroad could boast one telephone in practically every mile of its 10,000 mile system. 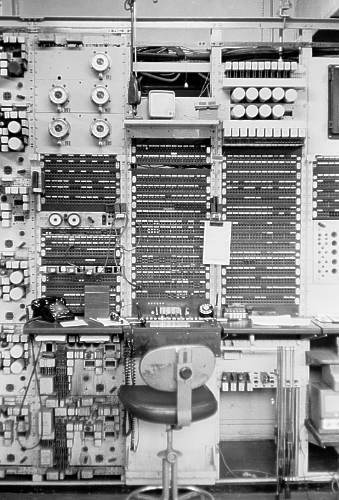 This vast communications plant was maintained and monitored from 19 test boards located throughout the system. The cash-starved condition of the Pennsylvania Railroad in its later years and its successor, the Penn Central, made it possible for some of these facilities to be seen in the late 1970's in almost the same condition as they would have been in 1955. After major reconstruction of both the Conrail and Amtrak portions of the ex-PRR lines in the early 1980's they are now gone, with the exception of "UD" office in Harrisburg. I became acquainted with this equipment rather late in its existence - during the Amtrak/Conrail era and thoroughly enjoyed the chance I had to work with it. As it was removed I was able to preserve a bit of "PO" test table in Philadelpha but so much more was lost. 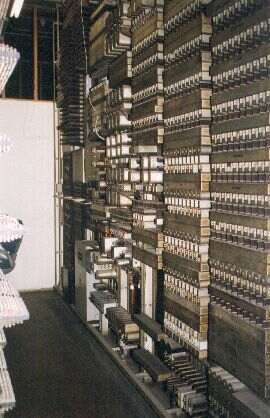 This can be seen in The Switchroom which is a sister to this site. I was also able to take a number of photographs of a few of the remaining test boards. Unless otherwise noted, the photographs are mine. I should have taken more! 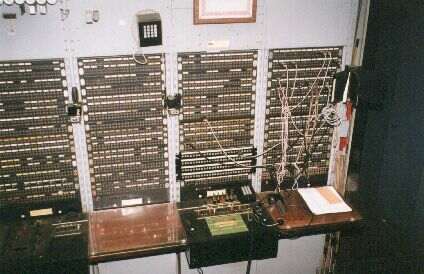 This Western Electric Number 5 Toll Test Board was located in room 367 in 30th Street Station. "PO" stood for President's Office. This telegraph call dates back to the time when it literally did serve the PRR president in Broad Street Station. The photos date from the late 1970's. This is another view of the test board. 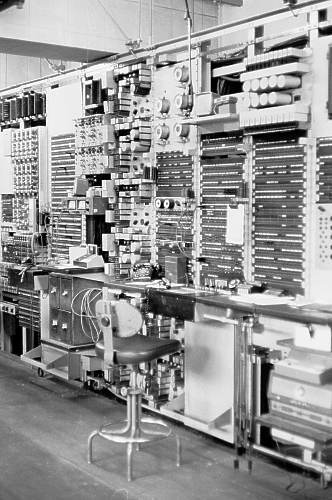 To the left are the 40AC1 carrier units that served the Teletype circuits. 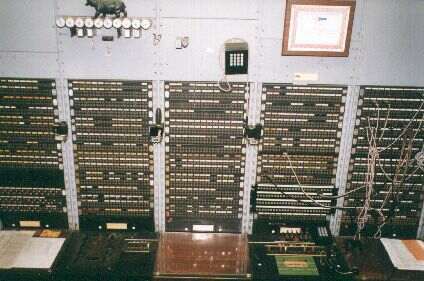 The gauges above monitor the pressure on the railroad communications cables. Below is a view of the right end of the test board lineup showing the power supplies. The MDF can be seen in the distance. 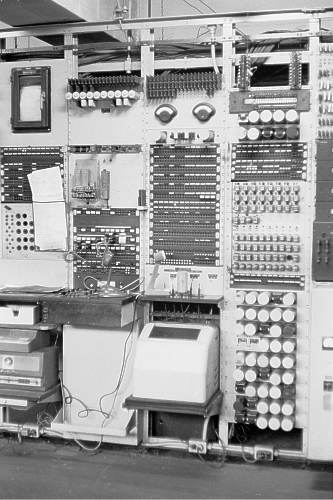 To the right of the test board was the "Sequential Selector" system which selected the proper destination for Teletype messages based on the routing codes entered by the Teletype operator. The system was designed and "home built" by PRR people. This beautiful test board in Pittsburgh lasted until Conrail vacated the station in 1978. Wire Chief Stan Mack is on duty. 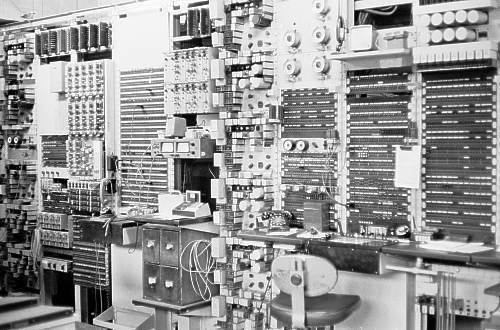 A closer view of the test board. That's 2:56 AM! Would you believe that they started vacating the building the next day? It's now condos. Believe it or not, this one is still around! Western Electric No. 5 Toll Testboard, voltmeter position. The Wheatstone Bridge is on the left, the Voltmeter position is on the right. Repeat coils, composite sets and other transmission components. Concentration unit relay groups. 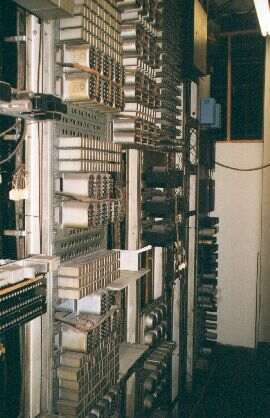 These serve the multi-line telephone consoles (Lamp and Key sets) at State interlocking and the Power Director's office. Main Distributing Frame (MDF) with protectors. 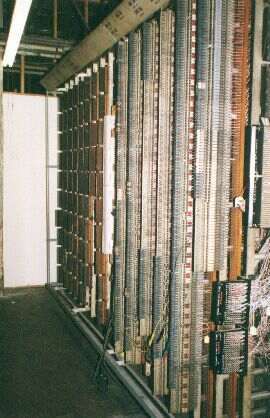 Fuse rack - Cables were protected with 7 amp fuses in the event they became crossed with traction voltage. 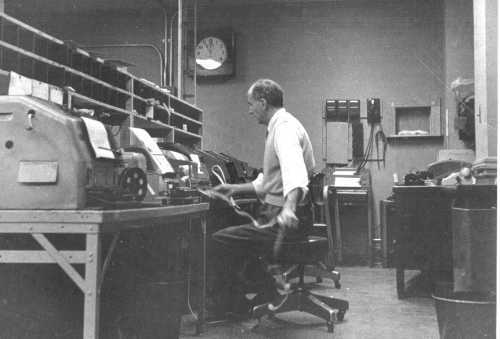 Telegrapher John Witkoski at the teletype. This office was located just across the hall from the dispatcher's office or "Movement Bureau" (official name) on the fourth floor of the original Pennsylvania Station, New York. There were windows on the wall (behind John) which overlooked the main waiting room. One person who worked there relates that "On slow nights we used to throw water ballons from these windows at the bums sleeping on the benches below." This picture was taken about 1962. 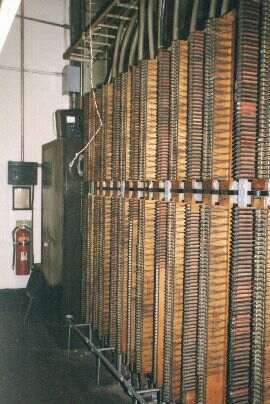 These master clocks, built by the Self Winding Clock Company of New York, provided the synchronization and stepping pulses for the clocks in Pennsylvania Station, New York and the adjacent facilities. 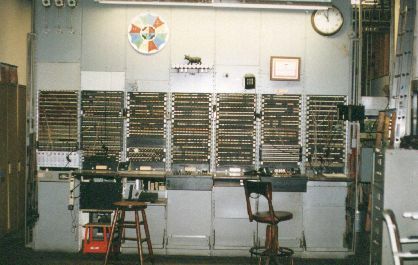 Two clocks were provided for redundancy They were moved to the relocated "NC" office prior to the demolition of Penn Station. One little known fact: all of those modern Solari clocks that were installed in the "new" Penn Station were advanced by these master clocks. RETURN HOME PRR Graphics courtesy of Chris Brandt.